The project is a mobile shop for street hawkers, incorporating a seat and fold-out display table into a trolley on wheels. See our previous story for more information. The Spaza-de-move-on by Doung Anwar Jahangeer won the inaugural SOUTH award at the 2009 Design Indaba. In early 1960s South Africa, ‘Café-demove-ons’ were present wherever there were substantial numbers of workers or city passers-by in need of refreshment. Vendors were frequently arrested in police raids and fined or imprisoned. Since the end of apartheid, South Africa has witnessed the phenomenon of rapid urbanisation. Thousands of workers commute daily between townships and cities to earn their livelihoods. 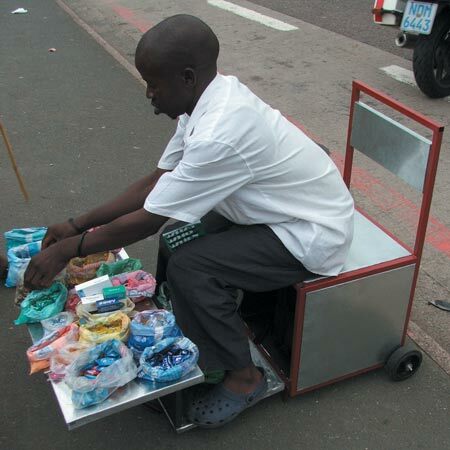 This has sparked a rebirth of the trade in refreshments, loose cigarettes, sweets and chips along pedestrian routes. As in the past, vendors face harassment by the powers-that-be.